I feel like I'm starting to get the hang of this crocheting thing a little bit, this is my second baby blanket and I took on the granny square. Granted I haven't tackled anything harder than a blanket, but baby steps right! Plus blankets are pretty useful, and make for really nice gifts as well! So, if you're interested, here are the details about what I used, and how it's done. This is just one giant granny square, I was going to make smaller ones and then thought, hmmm I'm just going to keep going until it got big enough that I was satisfied. I did 27 rounds, alternating colours each round. The edge is just two rows of single crochets. I guess I could have just done a granny stripe blanket, then it would look the same but be a rectangle rather than a square. I had 4 x 50 g balls of wool of each colour, and I used about 3 and a half of each colour (so approx 175g of each). If you don't know how to crochet a granny square, I watched this series of You tube videos this is lesson 1 (I think there are five or six) http://youtu.be/79zZJjXRfSM, the videos are really thorough and nice and slow, I found them awesome. Of course I have to flip everything around because I'm left handed. 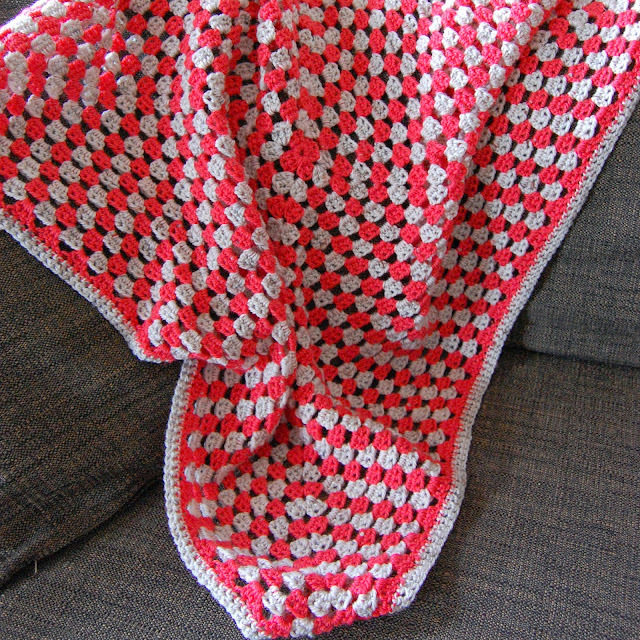 I think this is one of the easiest blankets you can crochet, and it was really quick!! So a great one for beginners like me! 4 comments on "A Huge Granny Square Baby Blanket"
I love the color scheme so much, and it looks so comfy that I think you just inspired me to try crochet!!!!!!! I've recently taken up crocheting and I'm in the middle of my first blanket! It's fun and easy and great do to with kids around! Well done on yours!